Bonterra at Woodforest is an active adult community situated in a superior setting in Montgomery, Texas. Bonterra is a desirable enclave of 700 single-family homes within Woodforest. The master-planned community of Woodforest plans to support a community where families can live in harmony with the land for generations to come. Homeowners will find everything they desire and more with top-notch amenities, well-planned home designs and surrounding picturesque views. Residents enjoy the dual benefit of exclusive access to a private age-restricted clubhouse in addition to the amenities in Woodforest. Nature enthusiasts love hiking through the vast woodlands, biking along the many scenic trails or picnicking in one of the many parks. Sports lovers can select their game of choice with a 27-hole golf course, tennis courts and playing fields. For those 55 and better who crave a life full of adventure, Bonterra is the ultimate place to call home with low-maintenance residences, wonderful amenities and an active lifestyle. To help you energize your body, mind and spirit, Bonterra at Woodforest provides the amenities, programs and personal support you need for your overall well-being and wellness, conveniently located right where you live. 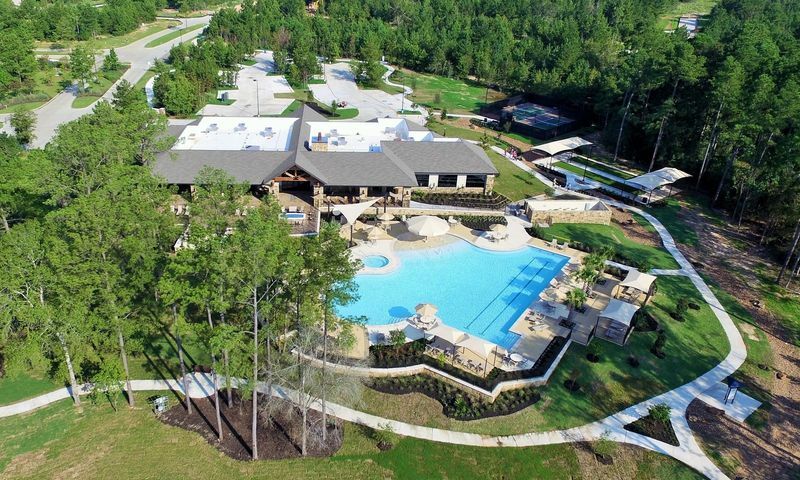 Residents have access to their very own 10,000 square-foot clubhouse that provides them with many exciting amenities such as a large events room complete with a kitchen, meeting rooms and other social areas. The clubhouse has a large fitness center and locker rooms ideal for those who like to stay healthy and in shape. For mental well-being, Bonterra at Woodforest also provides a continuing education center where residents can take classes. The amenities continue outside with a sparkling outdoor pool and beautiful patio, perfect for relaxing in the Texas sun. Homeowners can play a game of tennis and bocce ball or explore the community on the walking and biking trails. There are also pickleball courts, a fire pit, and events lawn. In addition to Bonterra’s private clubhouse and amenities, residents have access to all of the thrilling amenities offered within the Woodforest master-planned community. There is a 27-hole championship golf course, pro shop and restaurant, creating the perfect golfing experience. Homeowners living here can also enjoy several breathtaking parks, playing fields, swimming pools, tennis and basketball courts and miles of trails that wind throughout the community. There are even 90 acres dedicated to retail shops, restaurants and commercial use, providing everything you will need, all within Woodforest. Bonterra is a neighborhood located within the Woodforest master-planned community. Taylor Morrison began construction of Bonterra at Woodforest in 2014 and offers ten different models that range from 1,606 to 2,878 square feet. These beautiful single-family homes include two to three bedrooms, two to three bathrooms and a two-car garage. Some of the great features included in these residences are stainless steel appliances, energy-efficient windows and covered rear patios. Some homes also offer extra garage space, ceramic tile flooring in selective rooms, and additional bedrooms. The Sanctuary Collection by Darling Homes offers seven different floor plans. These homes range in size from 2,355 to 3,063 square feet. The include three bedrooms, two to three-and-a-half bathrooms, and attached two or three-car garages. Bonterra is private and intimate, yet set within a lively and luxurious community that offers a myriad of social activities and upscale amenities to make your life complete. The lifestyle director oversees daily activities and a multitude of diverse events geared towards forming friendships between neighbors and enhancing the community spirit. Residents can participate in many stimulating clubs, activities and social events including card games, golf, tennis, wine tasting and much more. Bonterra at Woodforest offers low-maintenance living, which gives residents more time to devote to leisure, activities and socializing with like-minded neighbors. The monthly fee covers front lawn maintenance, common area upkeep, and access to the countless amenities. Bonterra at Woodforest is nestled within natural wooded landscapes in bustling Montgomery County, Texas. The community is in a desirable location that is between The Woodlands and Lake Conroe. With some of the Houston area’s top attractions just minutes away, residents will never be bored. For all your shopping needs there is Target, Kroger, The Home Depot, Office Max, Walgreens, PetSmart, Walmart, The Woodlands Market Street, The Woodlands Mall, Outlets at Conroe, and Old Town Spring a short drive away. In addition, there is a Starbucks, Chili’s Grill & Bar, Chick-fil-A, Double P Bakery, Genuwine and Gold’s Gym only minutes away. Residents can also appreciate the museums, parks, lakes, golf courses and medical facilities that are in the surrounding area. Just like The Woodlands, Woodforest will have an exciting retail and commercial area so you will have everything you need at your fingertips. Convenience and location are two advantages for Bonterra at Woodforest residents, with many opportunities for shopping, entertainment and dining with the planned 90 acres of on-site retail space. With so much to do in and around the community, it’s easy to see why Bonterra at Woodforest is a sought-after active adult community in the Houston, Texas area. Residents have access to their own private amenities. Clubhouse - 10,452 Sq. Ft. Residents of Bonterra also have use of all amenities found within the master-planned community. Woodforest Golf Club - 12,000 Sq. Ft. There are plenty of activities available in Bonterra at Woodforest. Here is a sample of some of the clubs, activities and classes offered here. The Landmark Series features the most modest of the homes within Bonterra at Woodforest. These options range in size from 1,606 to 1,910 square feet and have two bedrooms, two bathrooms, and an attached two-car garage. The Summit Series offers four floor plans that range in size from 1,933 to 2,234 square feet and offer two or three bedrooms, two or three bathrooms, and an attached two-car garage. The Pinnacle Series is Bonterra at Woodforest's largest collection of homes. These single-family residences range in size from 2,374 to 2,878 square feet and feature two or three bedrooms, two-and-a-half or three bathrooms, and an attached two-car garage. Bonterra is an amazing community mainly because of the people moving into it! I have met the most wonderful singles and couples and all ends of the financial spectrum. I will say HOAs can be a feel high, but that is common for this type of community that offers so many private amenities PLUS all the amenities of Woodforest, the masterplanned community Bonterra is being built in. My in laws are considering buying at the begining of 2015 and we are excited to have them so close to us and our children! Bonterra is a beautiful community and the prices are very much in line with the average market. The previous commenter Barb said that prices were out of line for average middle class buyers. We just bought a beautiful home for $220,000. We looked around the whole area and it is hard to find a nice, brand new ranch home in a clubhouse community anywhere near here for that price. We already started meeting some of our future neighbors and they all seem very nice. We can't wait to move in! We are so excited to purchase a home at Bonterra. Our daughter, son-in-law and two grandkids live at Woodforest and love it. We really enjoy visiting their lovely home and enjoy the Woodforest community. The location is fantastic and it has so many wonderful amenities. When we found out the new Bonterra would be opening soon we stopped our search for a new home and decided to just wait until Bonterra was a little further along. We're looking forward to moving here within the next year or so! 55places.com is not affiliated with the developer(s) or homeowners association of Bonterra at Woodforest. The information you submit is distributed to a 55places.com Partner Agent, who is a licensed real estate agent. The information regarding Bonterra at Woodforest has not been verified or approved by the developer or homeowners association. Please verify all information prior to purchasing. 55places.com is not responsible for any errors regarding the information displayed on this website.